Budget exterior design changes can make your home more attractive quickly and it all begins at the front door! 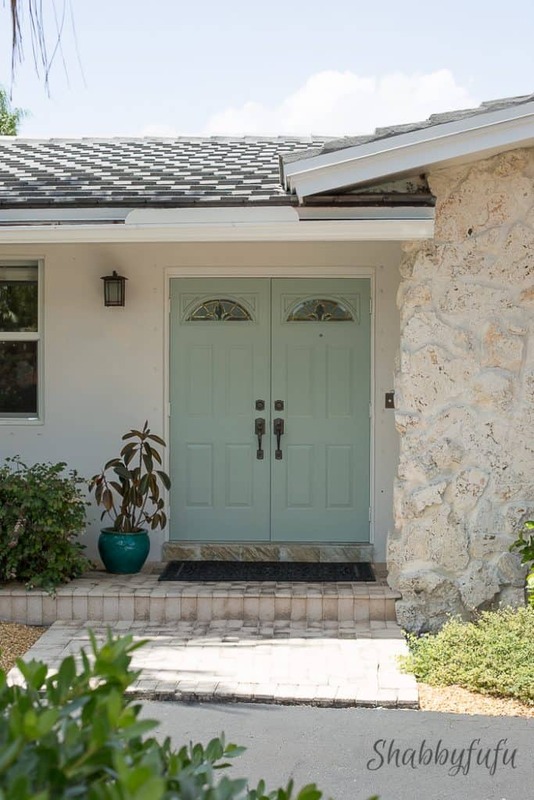 The front exterior of our home is pretty typical for this suburban south Florida neighborhood that was built along a series of canals in the early 1960’s. 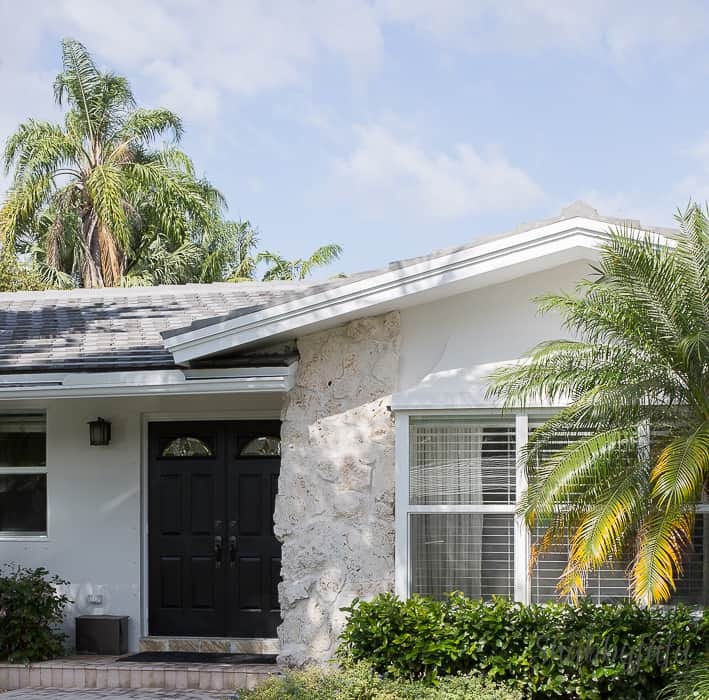 Block and stucco construction due to strict hurricane building codes, cement tile roofs, decorative coral rock and of course plenty of ubiquitous palm trees. Plain but pretty and newer homes tend to have a totally different and more modern look. I was first attracted to our home by the well established area, tons of mature trees and the school district. Our first starter home that we purchased before we were even married was in a new neighborhood of wood frame homes and since my husband is in construction he had been fearful of those homes being like matchsticks in hurricanes. Turns out he was right, since very shortly after we sold that home and moved into this one…Hurricane Andrew struck and our old home fared poorly. You would never know how stunning things are in the back of our home by what you see out front. We like that just fine, and haven’t done much other than the usual upkeep in the front. It was time for some upkeep this past spring and we had the house painted once again. We’ve done it before by ourselves, but we just didn’t have time and my husband has a painting crew now for his business. We choose a very light grey that is close to white with the trim a pure white and the front doors black, as per usual. 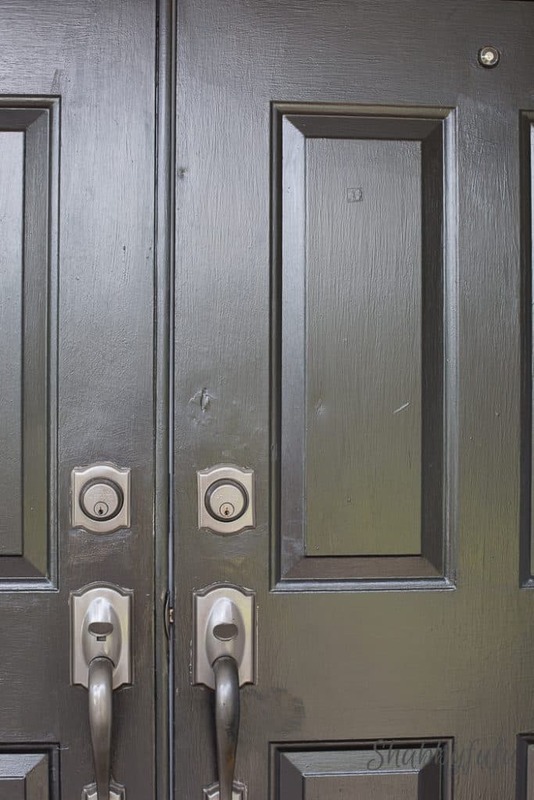 The original front doors on our home were solid wood and although I don’t have a photo of them I loved them. With the damage from Hurricane Andrew they needed to be replaced and we went with metal doors. There wasn’t much available locally after that storm and although I never liked these doors to begin with they’ve served us well. But look at the dings and dongs! We have filled them in several times but with the black paint they still looked awful up close. AWFUL! 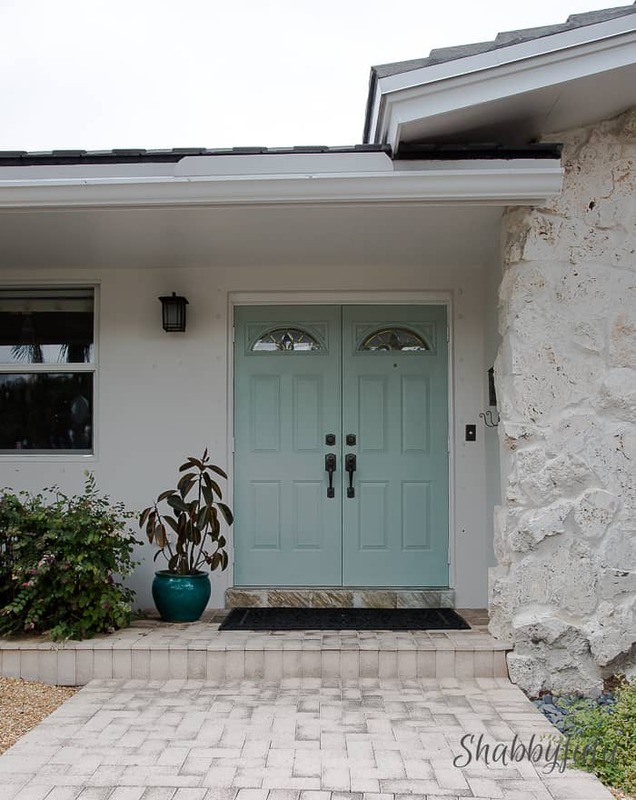 I started thinking lighter would be better and was inspired to paint the doors a more Miami color inspired by the sand, seas and tropical climate. My initial vision board started to form from front doors that I’d been saving in Pinterest. 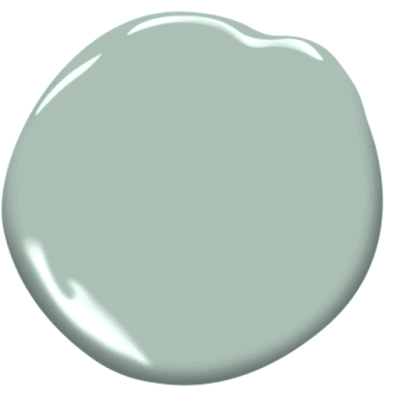 Mint, minty, seafoam…not too blue but more on the aqua green side. I worked with Lowes on this project, although this particular post is not sponsored. My color below comes from a brand that they don’t carry, and I took a screenshot of this swatch with my phone and had them match the color at Lowes. Did you know that you can get any color matched at most paint stores nowadays? You can even bring in a fabric swatch or magazine photo and they do a great job on color matching. 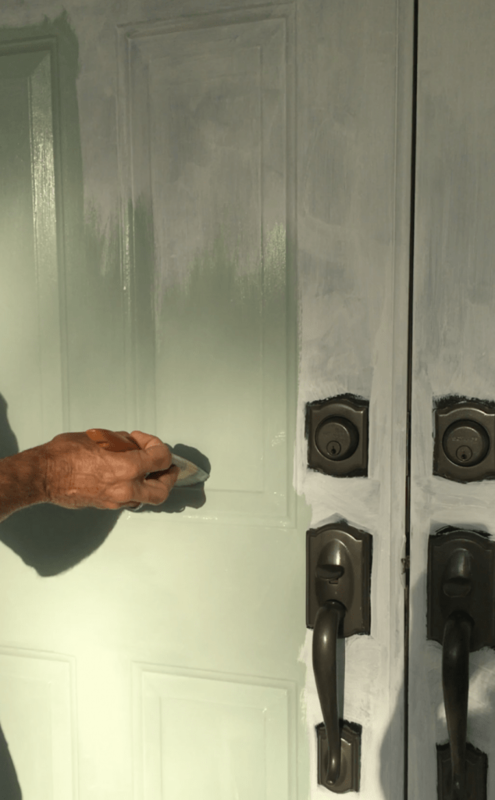 Some methods of painting a front door recommend removing the door and all of the hardware. I don’t see how that is very practical for most of us, especially since your home will need to be open for several hours while the paint dries. 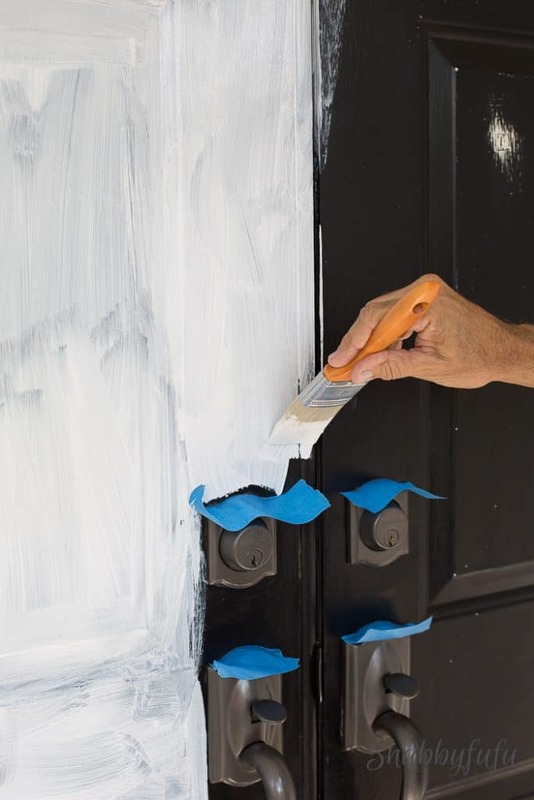 I recommend being slow and deliberate when painting doors, trims and yeah…pretty much anything and everything! Slow and steady and all of that is how I approach projects. My husband took on this job and gave the doors a light hand sanding with fine sandpaper. You could use a palm sander if you have one…either way go over all surfaces lightly and then wipe down to remove grit. We used an untinted water based primer and applied one coat being very careful not to get paint on the hardware and handles. One of the good things about water based primers and paints is that you can wipe off any mistakes quickly with a damp rag. Allow to dry and don’t paint in direct sunlight. Plan on giving your door two coats of paint, which in this case…even though we have double front doors did not even use up a quart. There are different sheen options and we chose a semi-gloss which is best for doors. We did not use a roller because after hundreds of painting projects over the years we’ve learned that if you pick the best paint available, it will self level and not show brush marks. That’s pretty much it for our budget exterior design makeover! Easy and not complicated at all and our home’s exterior truly looked completely different simply by freshening up the doors with paint! I love how the color looks different depending on the time of day and weather, where before it always looked black. The lighter color is much more forgiving and you don’t notice the dings and dongs, even up close. 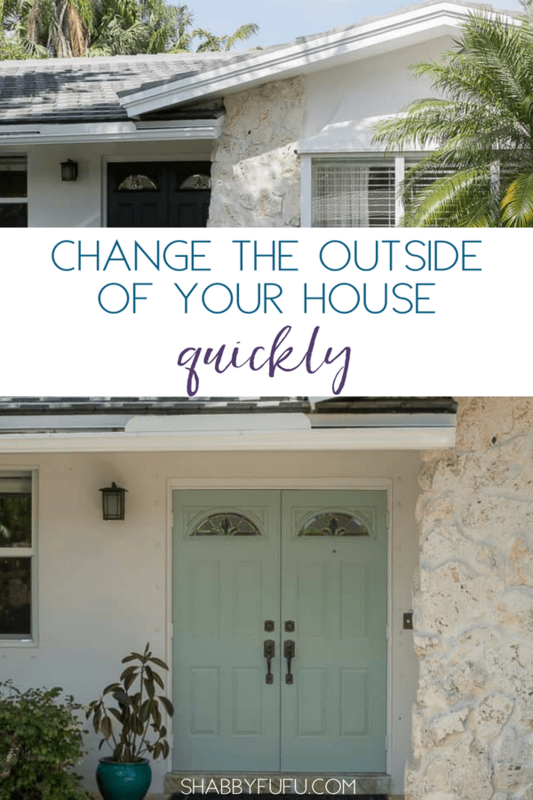 One of the easiest ways to completely change your home exterior is paint, and it’s budget friendly when you want a quick fix. The good news is that you can always paint it another color if your chosen paint doesn’t meet your design expectations! Fresh appeal with easy budget exterior design! Luv the color of the door !! Thank you for sharing vac pics. This is such a great refresh Janet and so perfect for Florida!! Oh it really makes a big difference! I love that color! Lovely doors, do you recommend painting the doors to coordinate with the inside? ?? Thanks Victoria! No, not necessarily. I had the doors black before and there is really no black inside my home. I thought that the look was rather French inspired with the shutters, but am going a bit more to the coastal side now. Hope that helps! Love, love the color Janet!! 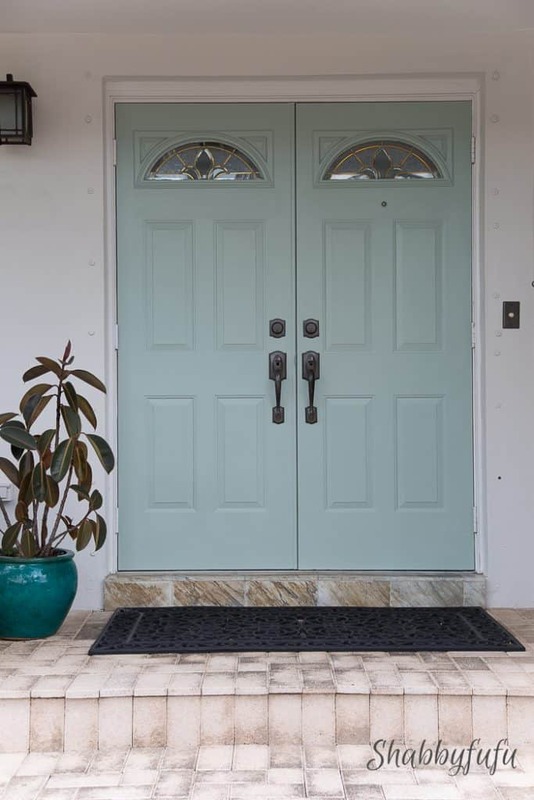 !…you brought back memories of Hurricane Andrew…such a beyond horrendous storm…I am sure that every time you drive up to the house, you must be smiling..as the doors look so beautiful! Have a great day Janet! Love the color! What a transformation! 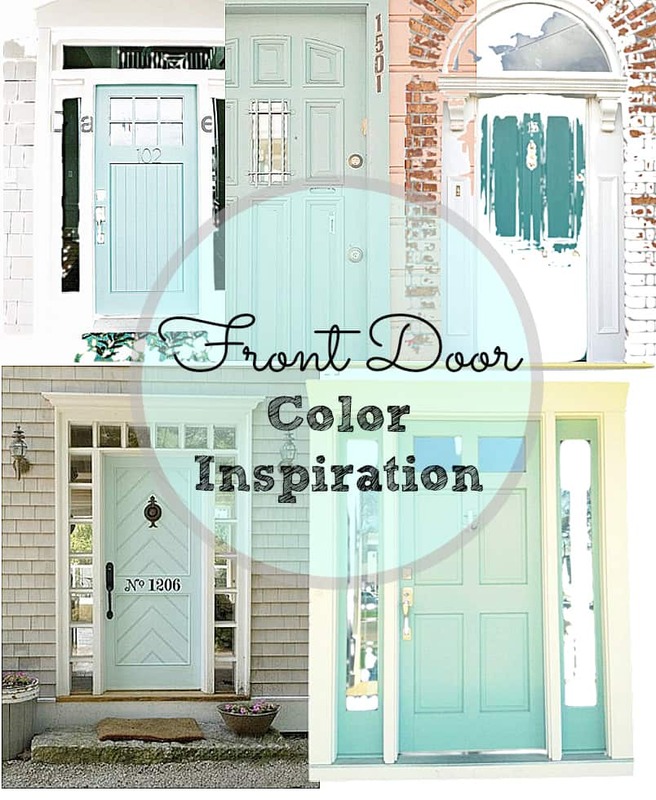 I adore the different door colors. Niceeee! Great refresh Janet. Love the color! Very similar to the door color on my home! Thanks Cindy. I was tired of the black that showed every imperfection and reality is that we do need new front doors!